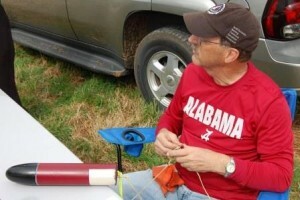 HARA gambled with the forecast on the Saturday morning TARC launch, March 12, and won, but had few takers. Two teams made one practice flight each at Bragg’s farm in calm air beating the rain that came later that afternoon. The HOPE Rising team from HOPE Christian Academy and the Falcon Rocketeers from St.John Paul ll Catholic High School were each represented by a single student who burned a motor to fly eggs. Duane Mayer burned several motors although the chuffing performance of a bad F threw his bird lamely into the air off the rail and then on to the ground where it fizzled until it popped. He had better luck on another flight with his Jolly Logic Chute Release which worked well. 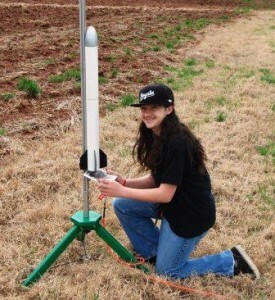 HARA’s launching looked better Monday March 7 at the Columbia Elementary demonstration. 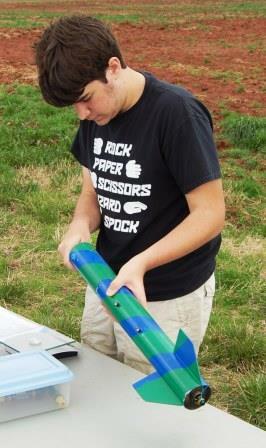 Elliot and Vince fired about a dozen small rockets before a crowd of about 700 students, which was the entire school population short of the kindergarten. The flights generally went well except for the one that drifted onto the school roof. The children were sufficiently hyped by the rocket countdowns to be useless in class for the rest of the day, but spring break is pending anyway.